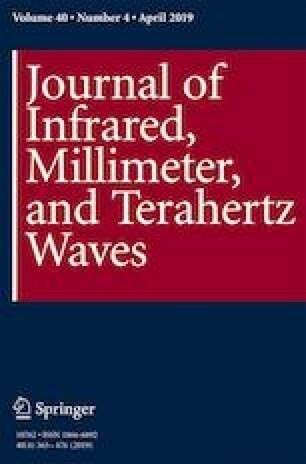 This paper reports a high-performance 90° waveguide hybrid coupler working in the full W-band. We demonstrate an 8-branch hybrid which features the low amplitude imbalance over a wide band by first increasing the waveguide height inwards and second introducing waveguide height discontinuity sections on the other inner side. Such a compact and robust waveguide hybrid coupler can be implemented in a split-block easily by current computer numerical control milling technology. The measured results show that the reflection and isolation are better than 16 dB, the amplitude imbalance is less than 0.8 dB, and the phase difference is within 90–4.25°/+ 2.38°, which are close to the simulations in most of the W-band. This work was supported in part by the National Natural Science Foundation of China under Grant 61801230 and 11190012, in part by the National Key Research and Development Program of China under Grant 2017YFA0304003, in part by the Scientific Instrument Developing Project of Chinese Academy of Sciences under Grant YJKYYQ20170031, and in part by the Startup Foundation for Introducing Talent of NUIST under Grant 2018r010 and 2018r018.